will genetically modified plants give the farmer better profits? Results from a study published in the January-February 2008 issue of Agronomy Journal say no. The study shows that Bt cotton is less profitable than a non-Bt variety in "any year or location". 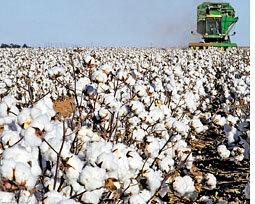 The research comes when companies and governments are promoting Bt cotton. Researchers from University of Georgia's College of Agriculture and Environment Science analyzed the produce of gm plants and compared them with non- gm ones. The study found that in 2001-02 gm plants gave low returns, while non-transgenic technologies brought in more profits. The trend repeated in 2003. Promoters of gm crops claim the plants fight pests better and farmers can save management time. Thus, general use of gm plants help farmers earn more. A benefit often attributed to gm production systems is the ability to farm more land with the same number of personnel. Contesting such benefits, the study says that gm system consistently performed badly in terms of returns. "This shows that the methods followed in gm field trials are quite unscientific in assessing the benefits and risks of the crops," says Kavitha Kuruganti of the Secunderabad-based ngo, Centre for Sustainable Agriculture. The study includes an important aspect that many gm trials ignore: gm plants have been produced based on their ability of fight pests but there is no uniform pest management package for all the cultivars. "In India, field trials are even more unscientific because they compare Bt cotton with chemical cultivation and not with methods such as non-pesticide management or organic farming. This results in misleading outcomes," says Kuruganti.